This beer continues to evolve (first time, second time and third time blogged about). It has been brewed multiple times between with another batch ready to bottle in a week or so. Why bring it up? Isn’t it ordinary? I bring it up because I really enjoyed this last batch and the current batch that is fermenting was brewed to the same specifications as the last. The first time I have followed this beer up with a re-brew. I added 3 grams of bitter and sweet orange peel to the boil and, for the first time, added 3 grams of bitter and sweet orange peel, soaked in vodka, at bottling. Of course I only added the orange vodka mixture to the bottling bucket. I no longer believe this beer to be ordinary. It isn’t extraordinary either. It is just a solid summer wheat beer with a nice orange citrus twist, well balance and easy to drink with friends. It goes over great, making it the perfect gathering beer. Enjoy! Useless Fact: 30 years ago, you could buy a Lifetime, Unlimited First-class Travel pass with American Airlines for $250,000. I have blogged about this beer over, over, over, over, over, over again. In all those writings I have never attached the recipe. It has evolved just about every time that I have blogged about it. I don’t think I have been searching for the holy grail but mostly because I was out of a certain malt or hop or both. 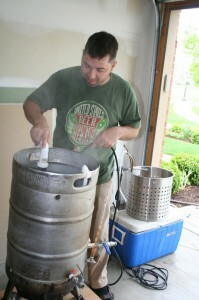 Yes, some of the tweaks have been to make it a beer I would like as much as the wife. 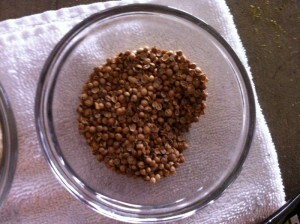 The beer I brewed today is potentially the last iteration. 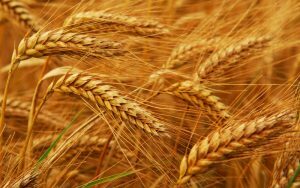 I always have 2-row, red wheat and munich malts on hand as well as S-05 yeast and Saaz hops. This is a simple recipe to brew with the coriander and orange peel being the only additions that keep this from being ridiculously simple. I have found that the mashing on the higher end (154.0*F) gives this beer enough body to stand on while not completely drying out (the S-05 can really attenuate). 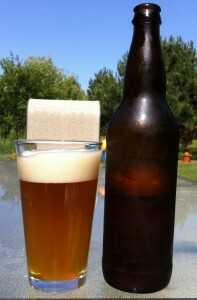 The orange at bottling adds a nice orange/citrus aroma that first greets the senses upon opening the bottle. Definitely a beer I will always have on tap once I can keg. Enjoy! 2014-08-17 Bottled with 4.1 ounces priming sugar, 2.0 cups of water. 4, 750ml, 20, 22oz, and 3, 16oz. 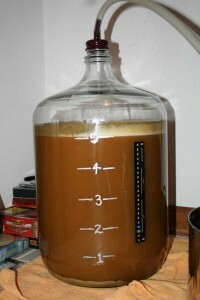 I opened the closet this evening to take a look at Grass Cutter and how well it was fermenting. To my surprise my nose was greeted with a closet full of soft orange. Nothing over powering, almost serene in nature at how perfect the aroma seemed to be. No, I am not beating my chest about my beer but the aroma is candy for the nose. This is my second brewing of Grass Cutter. 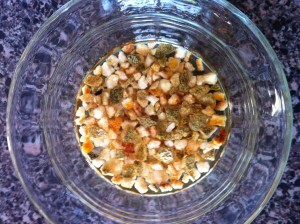 This time around I added some orange zest and crushed coriander. Now, I know from hops, that the aroma can be great in fermentation but all the aroma is blowing off through the blow off tube, never to be seen of again. So my thoughts turn to the idea that all this beautiful orange on the nose my shine brightest before it ever sniffs the bottle. I will keep to my guns and not add anymore to the brite tank or after primary is finished, I want the true notes of the coriander and orange at the last five minutes of boil to come out. Obviously time will tell and I hoping that some of this aroma finds it way into the bottle. Enjoy! 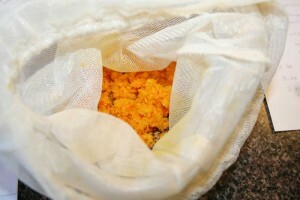 Now the request to brew more wasn’t a problem, neither was the request to add some citrus. I figured I would just do some reading of the online forums, searchin for orange additions to a beer and her orange citrus fetish would be addressed. After a lot of reading I decided that zesting an orange late in the boil would be the best way to inject this into the beer. I also had a brew club meeting on Friday, so I inquired on this topic once more. They mentioned using coriander also. About a half ounce of coriander, crushed and added at the same time as the orange zest (about 2 ounces which can be obtained from two large oranges): the last five minutes of the boil. I am not going to add either of these after primary fermentation is done as I want to find out what characteristics have been added to the beer without imparting additional aromas or flavors. 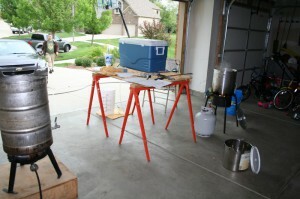 If I don’t think it is enough I can either add more or add in the brite tank the next time I brew the beer. 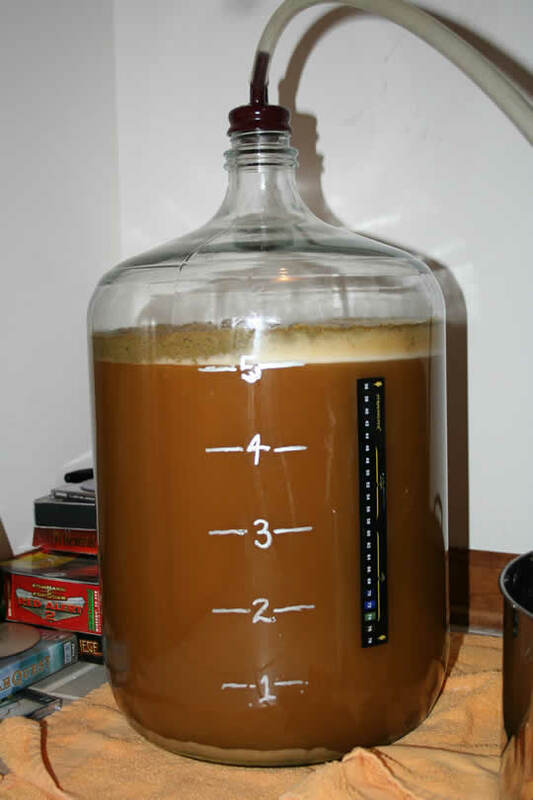 The beer was already fermenting away this morning but, as I always do, I will leave the beer for four weeks before bottling. I will be brewing another batch of this beer again this coming Sunday. No orange or coriander as there were plenty that liked this beer just the way it was (including myself).